was established in 1994 as a consultancy and service company offering customised solutions for our clients in pharmaceutical and healthcare industry as well as in the medical community world-wide. we are a slim organisation. we therefore act directly and quickly and are very flexible in regard to the client’s requirements. as a matter of principle, we do not work to the limits of our human resources to maintain speed, flexibility and the highest quality standards. additional “pros” for our clients are the broad spectrum of experience and our co-operation agreements with specialists all over the world enabling us to offer a “one-stop-shop” for our clients. 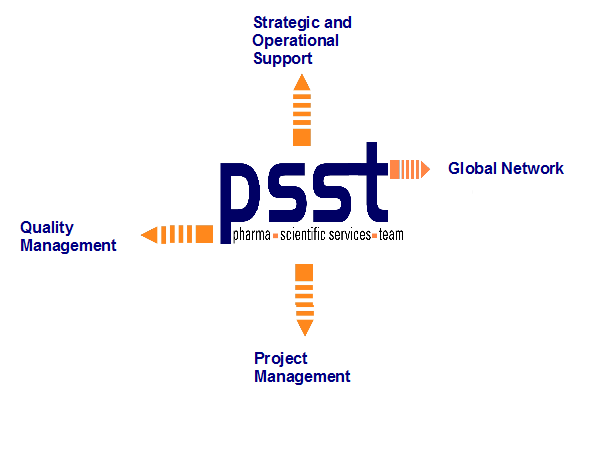 P.SS.T is primarily specialised in the area of new drug development, beginning with licensing and subsequent planning of pre- and clinical development phases and the respective project management up to marketing authorisation applications and pre-marketing activities. Monitoring of clinical studies is as well included in our own services. Additionally we offer resources from our co-operation partners worldwide. We provide scientific services for all sections of healthcare, medicine, medical devise, cosmetics and pharmaceutical industry. We provide you with regulatory affairs know-how, a specialised clinical research background and close contacts to opinion leaders in the following medical and scientific areas: cardiovascular, respiratory, metabolic and gastro-intestinal diseases, dermatology, immunology / transplantation, infectiology including AIDS, oncology, ophthalmology, osteoporosis, urology (BPH / prostate cancer). We are experienced with projects in biotechnology as well as “conventional” NCEs, in human and veterinary medicine, for medical devices and also nutraceuticals or cosmetics. We file for german and austrian national procedures, for european MRPs/ de-centralised and centralised procedures as well as for FDA, MHRA and other national agencies.